Yesterday was Darwin’s birthday. So instead of trying to shoehorn some sort of Valentine’s Day themed post for the week or an article about Darwin and his life and the importance of evolutionary theory, I thought I would briefly discuss a few of the most common Darwinian myths I have heard. For most people, it seems, it is accurate to say You Don’t Know Darwin, or Evolution, or Darwinian Evolution. 1. I don’t believe in evolution. Yes, you do. You just don’t know it because you’ve been lied to by people who don’t understand evolution either and are threatened by it. But before we get into that, let’s please dispense with the term “belief”. Belief requires faith with no evidence. Since there are mountain-loads of evidence for evolution, don’t believe in it. Accept the evidence all around you. Once you understand what evolution is, you will agree that you have to be brain damaged not to accept it is true. Here is the big secret. Here is the definition of evolution. That’s it. See? Not so painful. You’d have to be an idiot not to understand that things change. If nothing ever changed, we would have no history books and people could never complain about the “good old days” when students were better (yes, people have complained that today’s students are worse than the previous generation for literally over 3000 years, one can only assume that either the ancient Greeks were God-like brilliant or people are biased). What’s that, you say? That’s not what evolution means? Well, yes, it really is. But you want to talk about biological evolution. Some people think that simply saying change over time is overly simplistic and doesn’t really describe biological evolution. Ok, then. 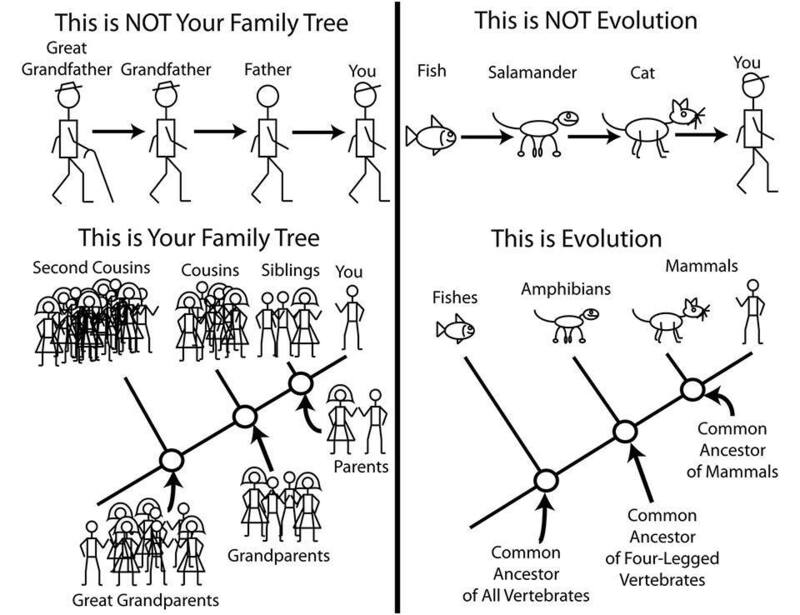 Here is a better definition of biological evolution. Ready? Seriously, that’s it. Children are different from their parents. Now, unless you are going to argue that you are exactly the same as your parents, that everyone is in fact a clone, you are an evolutionist. Congratulations. Oh alright. You may have heard that individuals don’t evolve, only populations, or even species. What that means is that one does not evolve over the course of one’s own lifetime. For most organisms, that is true. Of course, if you are a plant, which has what is termed modular growth, that is not strictly true. Plants can reproduce through one of two methods. They can reproduce through seeds, or they can reproduce through vegetative growth. In vegetative growth, the plants can send out tendrils (many people might call such tendrils “roots”). Those tendrils can grow horizontally through the soil and then spring up to grow what appears to be a new plant. The new plant is often called a clone, thus some people refer to this as clonal growth. 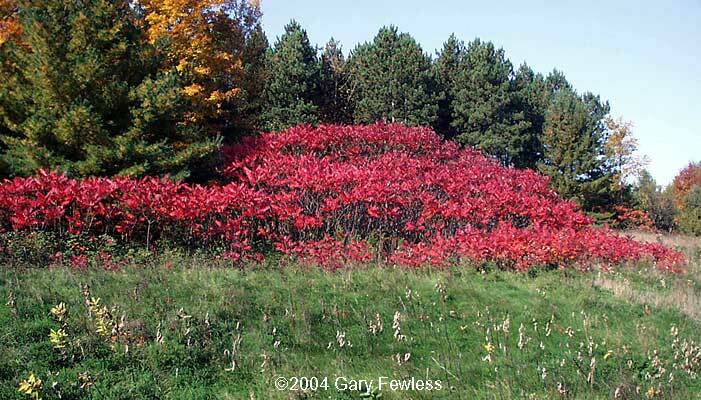 Cottonwoods and sumac are great examples of this, most of them you see are actually clones grown this way. I say clones, but that does not necessarily mean they are genetically identical. If a mutation occurs at some point in one of the cells in that root tip, it can get passed along through the continued growth of that root so that the clone is indeed slightly genetically different. Considering that some of these plants can grow vegetatively for thousands of years through thousands of “clones”, a fair bit of genetic diversity can occur from one end to the other. I mentioned earlier that this is called modular growth. It gets that name because mutations that occur at the root tips affect all growth after that point, but do not affect the part of the plant before that point. Different parts of the plant are effectively separated from each other genetically and, to a point, physiologically. This is why you can grow new plants from cuttings. If the plant didn’t have modular growth, you couldn’t do this. Just imagine cutting an arm off of a person and trying to grow a new body from the arm. Animals, like us, do not generally have modular growth (unless you are a starfish, or planaria, or…). Many people prefer a definition of biological evolution that takes populations into account. Thus, you will find this definition in many places. A change in gene frequency in a population over time. In this definition, evolution is restricted to changes that affect the DNA throughout a population. Ok, fine. But what does that really mean to a nongeneticist? It means that populations change over time in a way that those changes can be passed on to offspring. This is different than, say, changes in height and weight through strictly dietary changes. Just because Americans eat more and are thus typically taller and fatter than people in most other countries does not mean we have evolved to be taller and fatter, it just means we eat too much. It shouldn’t take a genius to realize this is true. A great example of evolutionary change in humans is our wisdom teeth, otherwise known as our third molars. Does it make any sense to anyone that we were created with jaws too small to fit all of our teeth so that we wind up having to pull some out? No, that’s ridiculous. The reason that our jaws are shrinking is that we have switched from eating tough, raw foods to softer, cooked, and processed foods that are easier to digest and we no longer have to chew as much. Some people are now being born who never have wisdom teeth. Eventually no one will have wisdom teeth and orthodontists will be very sad as a good chunk of their income will be lost to evolution. But what really defines a population? It should be clear by now that biology does not lend itself to neat little boxes. Biology is messy (if it stinks, it is probably chemistry, but that’s another discussion). Typically, a population is defined as a set of individuals capable of interbreeding. This is very much like the biological species concept (BSC). The difference is that a species can be divided into multiple populations because not every member of a species has access to every other member. If something gets in the way, you get separate populations of the same species. And here we have a problem. What is a species? Most people have heard about the BSC. Unfortunately, it doesn’t work for a lot of organisms. It doesn’t work for plants, who hybridize at the drop of a hat and can grow vegetatively anyway. It doesn’t work for bacteria, or parthenogenic species who only need females to reproduce, or animals that can be cut up like sponges and starfish and planaria, etc. The last time I counted, there were 26 different definitions of a species. The idea that a species is the only “natural” unit in taxonomy is a myth. Even species are not natural. Researchers use the definition that is most applicable to their research. For instance, paleontologists can’t possibly use the BSC. It is really hard to get fossils to breed. Some might even say impossible. As a result, paleontologists are stuck with what is called the morphospeces concept. If it looks sufficiently different, it’s a new species. This means of course that you can’t realistically compare modern and fossil species because they don’t mean the same thing. This is a really long-winded way of saying that it is much better to talk about evolutionarily discrete lineages, rather than populations or species and why I prefer sticking with the “descent with modification” definition of biological evolution. If that seems harder to deal with, biology is messy. Get used to it. But just because it is messy doesn’t mean it’s wrong. Life is usually messy. Just ask any parent. If you want absolutes and certainty, go talk to a physicist. Biologists have to deal with the real world in all its chaotic mess. I envy physicists, I really do. They have it easy. Yes, physics is easy. Biology is hard. Ok, that was a lot. But if you still say you don’t believe in evolution, you are deluding yourself. The other myths can be dealt with much more succinctly. 2. You have to be atheist to believe in evolution. Darwin was an atheist until he converted on his deathbed. I hear that a lot, but seriously? Are you seriously going to sit there and tell me these guys are atheists? Ok, maybe the last one, but this is an issue of pitting one faith against another, so please pardon the joke. “Your faith against his faith. Can you do that?”Count Barlow. 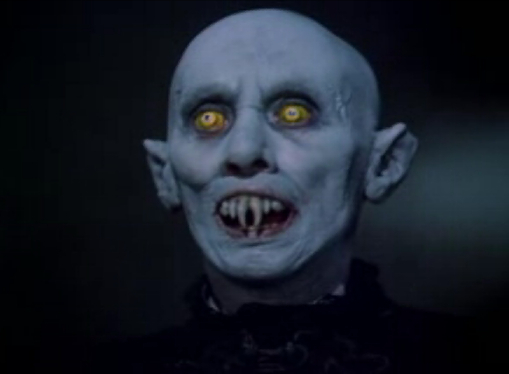 Salem’s Lot, by Stephen King. 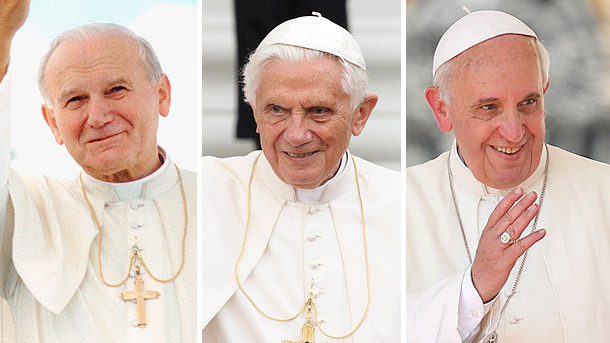 If you can’t trust that the Popes are devoutly religious, you have serious issues. But say you are one of those people that say the Popes may be religious, but they are going to Hell because they aren’t your sect of religion. Ok. Dr. Francis Collins is the head of the National Institute of Health. He led the Human Genome Project. He also happens to be an outspoken Evangelical Christian and has written extensively on why evolution does not conflict with Christianity. But Dr. Collins is a scientist, what does he know? What about Pat Robertson, leader of the 700 Club? Surely we can all agree that if Pat Robertson, of all people, does not think that evolution conflicts with Christianity, we can agree that you do not need to be an atheist to accept evolution. Ok, you say that Pat Robertson is crazy. I won’t argue with you. But what about Billy Graham? If there is anyone more respected in the Evangelical Christian community, I don’t know them. Billy Graham has no problem with evolution. He is clearly not an atheist. What about Darwin being an atheist? No, he wasn’t. He actually thought about going into the seminary to become a minister, but decided against it to pursue his academic interests. He didn’t seriously begin questioning his faith until his ten-year-old daughter died. After that, he lost faith in any sort of benevolent deity and he never recanted. The story that he converted to Christianity and denounced his views on evolution on his death bed is complete fiction. It was made up by someone who wasn’t even there. Why Lady Hope made up this story, I can’t say, but it is definitely a fraud. The important point here is that at no time did Darwin ever think that evolution conflicted with the Bible. 3. Evolution says that we evolved from monkeys, which can’t be true because A) I’m not a monkey, eww; and B) monkeys still exist. Tell me, do most mothers die in childbirth? Then why would anyone think that a species has to go extinct when a new species arises? The reason that people think this is because they still have this view of the Great Chain of Being,” which was an old Christian view that everything had its place in the universal order. Rocks were at the bottom, then plants, then lowly animals, on up to humans being the most important mortal thing in all of Creation, topped only by the Heavenly Hosts, Jesus, and God Himself (that bit always confused me, if God is male, then there should be a female God, so where is She? Nevermind, I digress, that’s a whole other discussion.) Anyway, with this view in their head, people naturally assume that evolution works the same way. One species should naturally transform somehow into a new species. How evolution works. Matt Bonnan. Peripheral isolates. 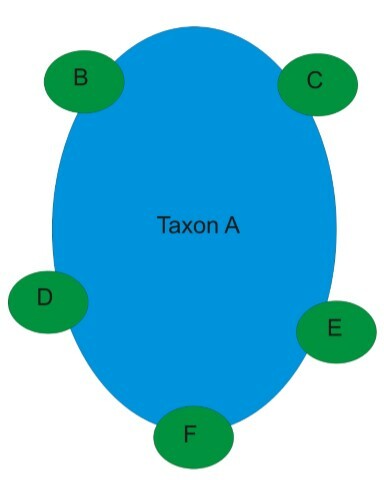 Taxon A is the original species. B-F are new species that evolved from the original species due to adaptation for the particular environments in that area. The original species is usually more of a generalist, able to survive in many environments. Except it doesn’t work that way. Not all individuals of a species have to evolve together. If that species is divided into separate populations, or evolutionary discrete lineages, each population could evolve into a separate species. The original, or parent species, never has to change at all. Take the peripheral isolates concept. In this case, there is a species that has a broad range. At the edges of the range, members of the species find themselves in a different environment from the members of the species in the center of the range. The population exposed to the new environment will evolve in response to that environment, but the population in the center of the population never has to change. Thus, you have two or more species evolving from an original species that is still present. But what about humans evolving from monkeys? No, that isn’t technically true either. Again, using the family analogy, let’s say your parents had siblings. Your aunts and uncles had kids of their own. You are related to your cousins through your parents. Pretty straightforward, right? Now replace everyone with species. You and all your cousins would be individual evolutionarily discrete lineages, you all have your own evolutionary path. Now, say that you represent all humans and your cousins represent all the species of monkeys. You aren’t a monkey, neither are your parents. your cousins, on the other hand, are (sorry, cuz). You (meaning all humans) share a common ancestor (your parents, or the ancestral species of humans) with your cousins (all the monkeys). 4. Evolution says that the earth is really, really old. No, evolution has nothing to do with how old the earth is. The geologic time scale was actually put together by people correlating different rock units based on their relative position. Using the Law of Superposition, the oldest rocks were at the bottom, with the youngest rocks on top. Examining the rocks from place to place, they were able to line up different rock units into a long column. But it was all relative. They had no idea how old the rocks were. Finding the age of the earth didn’t happen until physicists discovered radioactivity. Some very smart physicists figured out that they could use the rate of radioactive decay to date rocks. All paleontologists and evolutionists did was say Thank You! So if you don’t like the age of the earth being over 4.5 billion years old, go talk to the physicists, it has nothing to do with evolution. Of course, when you do talk to them, you will have to deal with the fact that they have tested the theories quite well. We know they work because if they didn’t, we would not have nuclear bombs, nuclear power plants, x-ray machines, and a whole host of other things that work because of our understanding of radioactivity. 5. How does evolution explain the origin of life? Easy, it doesn’t. Evolution only works on life that already exists. If you want to complain about the origins of life, go talk to a chemist. The origins of life is a chemical and physics problem, it has nothing to do with evolution. The last one for today might surprise people the most. Darwin did not invent, discover, or in any way introduce evolution. People knew that organisms change long before that. Joseph Buffon discussed the mutability (change) of species and that they had common ancestors in the 1700s. What Darwin did was provide a plausible mechanism for how evolution worked. Darwin provided evidence for natural selection. Of course, Darwinian evolution via natural selection is not the only mechanism. There is gene flow, which involves new material being introduced by immigrants into a population, and genetic drift, which is simple, boring, old random chance. But that is a topic for another day. By paleoaerie in Myths and misconceptions, Paleontology on February 13, 2015 .